1. 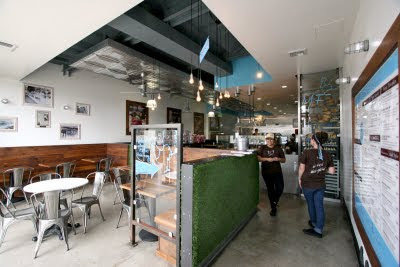 How did Mendocino Farms come about (both the restaurant and the name)? Mario- I have been a sandwich aficionado, since I was a little kid. When I would travel anywhere I would always and still do- order the places' "best sandwich". My family is originally from Northern Italy were it is a custom to eat your left overs from big dinners as sandwiches the rest of the week (kind of like turkey sandwiches after Thanksgiving). So, I grew-up having these amazing panini- like Veal Osso Bucco as the protein and risotto alla milanese as the spread and sauteed spinach in garlic as the greens. In creating Mendocino Farms, I wanted to use that same approach of fine dining level ingredients, re-articulated into the sandwich form. It was tough to find a great sandwich that was affordable in LA- so, I decided to start making them myself. 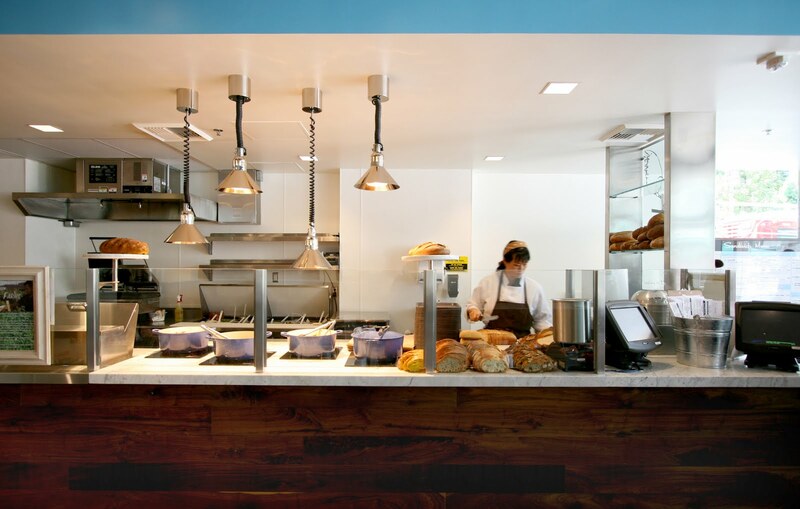 The name Mendocino Farms comes from my love of Mendocino County. As a kid, I visited Mendocino often and I was always blown away by how supportive the community was of their local farmers. It was the first place I ever saw a farmer's market- this was the early 80's- far before it was an en vogue idea. When creating my sandwich shop concept, I wanted to support local, sustainable farmers- so, I decided to name the concept after the area that inspired me. Judy- I got involved with Mendo when one of my closest friends told me about them a few times, actually, before I applied for a job here. The first time, I was not that interested because I was still pretty sure that I wanted to stay in fine-dining. The second time around, however, I had a change of heart. I liked the idea of creating interesting and new flavor profiles for such a large audience. 2. Are you guys surprised at all by the overwhelmingly positive reaction to MF? Mario- I knew that I was desperate for a great sandwich- I did not really expect that as many people felt the same. So, yes- we feel grateful everyday that guests appreciate the thoughtfulness and energy we put into our sandwiches. Judy- I’m not sure if “surprised” is the right word for me. I would say that I feel extremely lucky that so many people understand what Mendo is trying to do. We work really hard and are extremely passionate about what we do. We are constantly tweeking current items and pushing the envelope on others. To have guests appreciate our point of view is rewarding- just not surprising- we have a very intelligent base of core customers. 3. Will you guys be riding this wave with expansion? 3. Where do the new sandwich ideas come from? Judy- A lot of ideas come either from ideas we have while eating a meal. I often ask myself if I could incorporate a complete meal into a sandwich. Or, it’s some interpretation of a traditional sandwich, like our Pork Belly Banh Mi. We have weekly R&D meetings where new ideas are discussed and tested. We also have suggestion boards in the restaurants that we read as well as following our guests conversations on facebook. We are some times a year out on some of our sandwich ideas- we have some incredible sandwiches premiering this Fall and Winter! 4. What are your favorite Mendo sandwiches? Mario- I really try to eat all around the menu everyday, but it is hard not to take a bite out of the Steak BLT when it is around. And because I grew-up on a farm- it is hard not to have the Heirloom TBL during the Summer. It is so impressive that Chef Judy has been able to forge such a great relationship with Scarborough Farms to get the best heirloom tomotoes I have ever had. 4.5. What are your favorite other LA sandwiches elsewhere? Judy- I love traditional Banh Mi sandwiches, and find myself at Vietnamese sandwich shops quite often. 5. What do you say to someone dumb enough to say they don't like MF? Or, "It's too fancy for me" or something? Mario- Really good question by the way. I believe that everyone has a "foodie" inside of them. If someone thinks are sandwiches are to creative or too expensive- it is our fault- we have not introduced them to the right sandwich and we have not properly shared with them the quality. Subway and Mendo are not the same food- even though they have the same name- It is our responsibility to share the value with the guest, not theirs. Judy- Food is such a personal thing, I never take offense to anyone who doesn’t like what we end up producing. If I’ve learned anything while working for Mendocino Farms, it’s that people’s preferences in food span over a huge spectrum. I don’t ever think that I can please everyone. There will always be someone who doesn’t like something for one reason or another. We do, however, try to please as many people as possible with every decision we make.